Yosemite Forum • View topic - Maria Lebrado - Southern Sierra Miwok matriarch or Paiute. Maria Lebrado - Southern Sierra Miwok matriarch or Paiute. When you enter Yosemite National Park you won't find the story of Chief Tenaya in Yosemite National Park. Chief Tenaya was the chief of the Ahwahneechee people of Yosemite Valley. But what you will find are several signs with Maria Lebrado on them. Who was Maria Lebrado? Maria Lebrado was the grand daughter of Chief Tenaya. 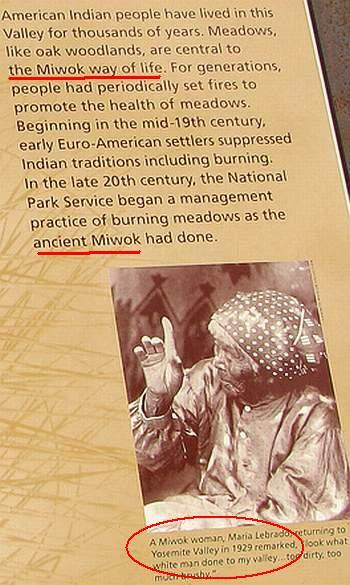 Here she is on one of the signs in Yosemite along with the lie that the Ahwahneechees were Miwoks. Tenaya's story is not on any signs in the Park today. What Yosemite National Park has done is taken Tenaya's story out of Yosemite and has started with the story of Maria Lebrado Yrdte instead. Maria stated she is the grand daughter of Chief Tenaya and the Park says she is a Southern Sierra Miwuk...but was she? We did Maria's family tree using the documented proof. Maria Lebrado's family tree shows she could not be Miwok as the Park claims. When Dr. Bunnell met Chief Tenaya he documented that Tenaya was 1/2 Ahwahneechee and 1/2 Mono Lake Paiute. 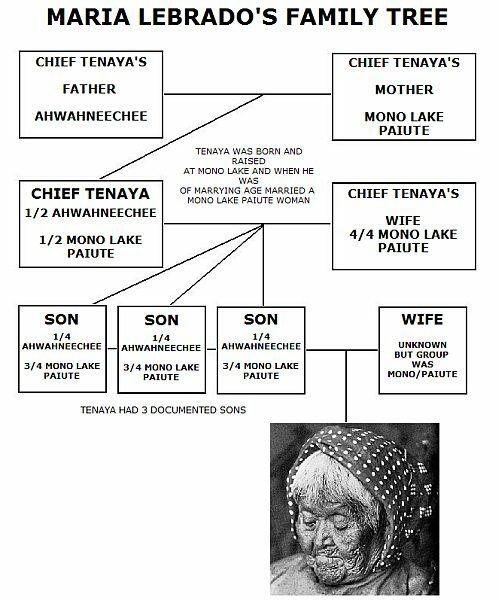 Tenaya was married to a Mono Lake Paiute woman and was documented to have 3 sons. Tenaya's sons would be 3/4's Mono Lake Paiute and 1/4 Ahwahneechee. Bunnell wrote that James Savage could speak Miwok, but Savage could not speak to any of Tenaya's band when he captured them. But Savage said that Tenaya's band spoke Mono Paiute. This means that Tenaya's sons were probably married to Paiutes also. So this means that Maria Lebrado's father was 3/4s Mono Paiute and 1/4 Ahwahneechee and married to a Paiute. Meaning that Maria Lebrado was 7/8's Mono Lake Paiute and 1/8 Ahwahneechee. So Maria Lebrado could not be a Southern Sierra Miwok...she had to be a Mono Lake Paiute. LOUISA, LEANNA AND GEORGE ARE DESCENDENTS OF CAPTAIN SAM . MARIA LEBRADO IS SAID TO BE HIS DAUGHTER ALSO . I am an author writing a book set in Yosemite called Graphic The Valley (my publisher is releasing the book next July), and this cover-up is key to the backstory in the book. My family is Cherokee, my wife and daughters, not Pauite, but this whole thing is wrong. This sort of this happens over and over and it has to be made public. We have to make it public. I'd love to talk to someone about this issue. Please email me at hoffmeister@4j.lane.edu.